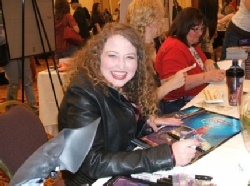 Anne Elizabeth was the Columnist for RT BOOK REVIEWS Magazine on the topic of Comics, Manga, and Graphic Novels. She also wrote comic industry news updates and feature columns. Listed below are some of her interviews, but this list does not include all of her industry contributions.